I’m supposed to be writing about my personal experiences with Trinity Lutheran Seminary’s Summer Seminary Sampler (like here, here, and here). I’m also supposed to be writing about the DOMA and Voting Rights Act decisions recently made by the Supreme Court of the United States. Instead, I’m writing about the people I admire most. News of the tragedy in Arizona, the death of 19 firefighters in the line of duty, hit me hard. My father is a Chicago firefighter. His father is a retired Chicago firefighter, and both of his brothers are Chicago firefighters (his oldest brother recently retired). My father was the first among his brothers to join the department. One day, when I was a little kid, my mother woke me up to tell me that my father had been in an accident. He came into my room in a cast and on crutches, which is a pretty weird and scary thing for a little kid. A piece of burning building fell on his foot and broke his ankle, which required a steel plate and left him with an on-again/off-again limp. When I was a few years older, he received an award for valor. I can never remember which award it was–Lambert Tree / George Harrison, Firefighter of the Year, or something else. It hangs on the wall above his dresser, right above the change jar and the Eddie Belfour puck and sports card my sister and I got him. In college, I saw the movie Ladder 49, a movie about a Baltimore firefighter. That night, I called my father and was grateful that he didn’t pick up–I don’t know if, at that time, I could have told him how I felt in person (we’ve talked about it since). I left a message saying how proud I was to be a firefighter’s son, but on the inside, I finally realized that any day could be a day he wouldn’t come home. The firefighters in Arizona knew that one day, they could lose their lives; but on the morning of June 20, 2013, they didn’t know it would be that day. They did what they always do: run toward the danger while everyone else ran away and try to keep them safe. My cousins, my uncles’ kids, came to similar realizations somewhere along the line too, and it’s one of the many bonds we share. 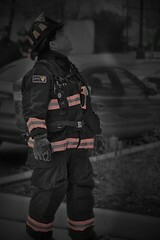 I have more admiration for firefighters than I do any other organized group of people. Firefighters and their EMT partners have one job–to save the lives of others. And they do it without killing and without becoming idols. My admiration isn’t reserved just for firefighters. I admire anyone who willingly puts themselves in harm’s way for the sake of another, and who does so without violence. I admire anyone who has the courage to stand up for what they believe in, without attacking others. I admire those who follow their hearts and can give society the finger when society tries to lock them into being something else. And I admire all of us who are deeply, deeply flawed–not just in an abstract, “oh that’s nice” way, but with actual flaws that cause us to lash out and hurt others–and are still able to face the world every day through grace. St Florian’s Cross (Photo credit: Ben Woodruff) Not exactly like my pendant, but close. A week after my seminary graduation, a package arrived from my sister. Inside was a pendant, a firefighter’s Florian Cross (commonly mistaken as a Maltese Cross), with an inscription from Paul’s letter to the Philippians on the back: “Christ strengthens me.” It was the most emotional gift I received. It reminds me of the flawed people whom I love and admire, and spurns me on towards my goal of becoming a fire department chaplain somewhere, someday. These are the people I admire most. Featured image: “Chicago Fire Dept.” by Trey Ratcliff is licensed under CC BY-NC-SA 2.0. Posted on 3 July 2013 17 November 2013 by Pastor KenPosted in PersonalTagged Arizona, Chicago, chicago fire department, EMT, firefighters, granite mountain hotshots, Prescott fire department, Yarnell hill.